Empires of Eden is very proud to announce Steve Grimmett as one of the feature artists on the upcoming album Reborn in Fire. 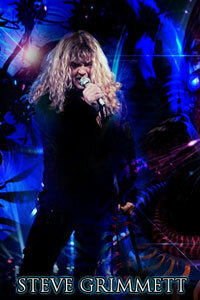 Famous for his vocals for legendary NWOBHM bands Grim Reaper, Lionsheart and Onslaught, Steve is featured on a full-length song on the album. Featured on the track „Beyond Daybreak“, Steve delivers an emotive and aggressive vocal performance that illustrates why he is one of the most influential voices in heavy music. From guitarist Stu Marshall: "Steve was one of the sought-after performers I tracked down and thankfully he agreed to be involved in the project. The track needed to be heavy while retaining the melodic flair that Steve is known for; as a fan, that's what I wanted to hear from him. This concept is one of the great things about EOE: the singers all compose their own lyrics and melodies, providing a window into what makes many of them as great as they are." Reborn in Fire, the new album from Empires of Eden features an impressive list of some of the world’s most respected heavy metal voices including Mike Vescera and Zak Stevens. Released by 7Hard, the album is set for release in June and will be available on iTunes through Activist Music. A 30-Piece orchestral score / 8 singers / one album: Reborn in Fire. Check www.empiresofeden.com and www.7hart.de for all news and pre-release information.